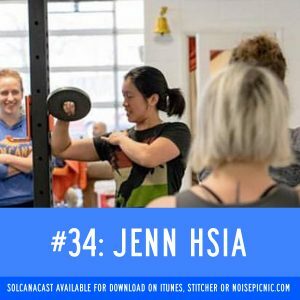 Join us this week as we interview Solcana’s Olympic weightlifting coach, ENT surgeon Jenn Hsia. Learn her story, how she got into crossfit, lifting, and why she carries a scale with her everywhere she goes. If you go to crossfit and have ever snatched or clean and jerked a barbell before, these are the olympic lifting moves and this is the episode for you! Tune in to listen. And don’t forget to like us on Facebook at Solcanacast! AND AND don’t forget to write us a review on iTunes. You’d be the first and if you do, we’ll give you a shout out on the podcast!